Covington was organized as a borough by a decree of court of common pleas of Tioga County in the year 1841. It remained a borough for several years and suffered its charter to become void. In the year 1851 it again applied to the court and again was chartered. Mention has been made in the history of the township of many of the old settlers and will not be here repeated. Among the most prominent citizens in the early history of the borough were Thomas Putman, Edwin Dyer, Stephen Packhard, John S. Hoagland, Thomas Dyer, John C. Bennitt, Elijah Gaylord, O. F. Taylor, Samuel Baber, Phineas P. Cleaver, David Caldwell, Ira Patchen, Elijah Putnam, Peter Keltz, John G. Boyd, Butler Smith, Julius Doane. From 1840 to 1855 Covington was one of the greatest business centres in Tioga County. It was located where the Williamson road made in 1792 and the state road completed in 1808 intersected and crossed each other, they then being the two greatest thoroughfares in the county. 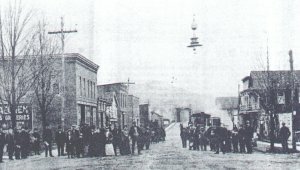 Its citizens were enterprising and erected churches, school house, mills, manufactories, hotels, stores, glass works and "Covington Four Corners" were known far and wide. As we have stated in 1851, the borough charter of Covington was renewed. The first burgess under the new charter was Gen. Knox; clerk John Lang; street commissioners Martin Gerould and Elijah Gaylord; treasurer O. F. Taylor; collector Ira Patchen; poormaster Anson L. Johnson. The chief burgesses have since been George Knox, W. C. Webb, Thomas Putnam, John C. Bennitt, Edwin Dyer, H. M. Gerould, Ira Patchen, Leonard Palmer, Perley P. Putman, O. G. Gerould, A. M. Bennett, Jacob Hartman, E. B. Decker, Charles Howland, William Lamkin, Edwin Klock, J. M. Hoagland. Some of these have been elected and served as many as five terms. A. M. Bennett is now the burgess. Covington borough is situated five miles north of Blossburg, fives miles south of Mansfield, twelve miles east of Wellsboro and seven miles southwest of Mainesburg and now contains about eight hundred inhabitants. Within the past three years it has increased in population very materially. The purchase of the window glass manufactory by Messrs. Hirsch, Ely & Co., and the employment of quite a number of men by that company, has been one of the causes which have been instrumental in reviving the borough. The building of a number of fine dwellings and business places together with several industrial establishments have also encouraged and stimulated the business prospects of the borough. It is situated in the center of a good farming country with railroad transportation facilities afforded by the Tioga Railroad. There are several churches, a graded school, an Odd Fellows hall, a saw mill and shingle mill, a grist mill, a glass manufactory whose capacity is about 40,000 boxes of glass annually, giving direct employment to about forty men, a fruit evaporator, two hardware stores, one drug store, one jewelry store, three general stores, one bottling establishment of mineral water, a barber shop, a shoe shop, one hotel and several groceries, a harness shop, two gun shops, one wagon makers shop, two blacksmith shops, an express office, depot, post office and reading room, several branches of lodges of Knights of Labor. Baptist Sunday school organized January 1st, 1881. In 1815, a public school was organized and in 1816, a school house built. First Presbyterian Church organized July 27th, 1841. First pastor Rev. Julius Doane. Church of Christ, first known as "Christian" was organized in 1840. Elder Whitehead officiating. The Rev. Caleb Boyer held Methodist service, in Covington in the year 1809. The present M. E. Church was erected in 1848. In 1841 Prof. Julius Doane and Miss Lucy Putnam established a high school. The building was on the west side of the Tioga River. First Baptist Church was organized in 1861. It had been known by another name previous to that date. Rev. George Spratt, a native of England officiating in 1839. The late Horace B. Clark blew the first glass in Tioga County, Pa., at Blossburg, in the year 1847. He resided for many years before his death, which occurred February, 1884 in Covington. Covington Lodge No. 274 I.O.O.F. was instituted August 10th, 1848. The first officers were Theobald Miller, Noble Grand; Ellis Gamble, Vice Grand; George W. Boothe, Secretary; Ira Day, Assistant Secretary; O. F. Taylor, Treasurer. The officers were installed by D. D. G. M. Garreston of Tioga. Members initiated then, Col. N. A. Elliott; Philemon Doud; Lorenzo D. Taylor; Hugh McCabe; Henry Hall and Alonzo Noble. This is the parent lodge for eastern and southern Tioga County. Emma Colfax, Rebekah Lodge No. 15, I.O.O.F. was organized Sept. 22, 1869, D.D.G.M., G.M. Butler officiating. Charter members were G. M. Butler; O. G. Gerould, J. C. Bennett, D. S. Irelan, Sr., A. M. Bennett, C. F. King, Joseph Hyland, Lyman W. Kiff, H. G. Levalley, Andrew McIntosh, Edward D. Roberts, David S. Irelan, Jr., Richard Ashley, Miles G. Lee, James M. Everetts, George W. Keltz, Simon Green, L. R. Walker, Stephen F. Richards, L. W. Woodruff, H. A. Fisher, George A. Kinney, Jacob Hartman, Nelson Clemmons, W. S. Holman, George W. Johnson, Lucy Butler, Olive Bennett, Mary Gerould, Maggie Irelan, Frankie Bennett, Julia Keltz, Susan Green, Mrs. S. F. Richards, Susan Roberts, S. C. Kings, Ella B. Levalley, Mrs. W. Woodruff, Malvina L. Kiff, Ida O. McIntosh, Mrs. Richard Ashley, Martha Lee, Aurelia Walker, Hester A. Fisher. Past Grands of I. O. O. F. No. 274 have been Theobald Miller, George W. Boothe, Benjamin Kress, Ira Day, O. F. Taylor, L. D. Taylor, Hugh McCabe, Jacob Whitman, Matthew Skelley, Charles S. Videau, H. Whitman, John L. Lee, John Lang, D. W. Gitchel, Charles Jacques, John C. Bennett, J. B. Husted, A. M. Spencer, Ira Patchen, Thomas Videau, I. P. Keltz, Edwin Dyer, S. L. Barber, L. K. Spencer, S. B. Cockran, T. B. Goodenough, David Caldwell, H. M. Gerould, Fred .R. Caldwell, William Butler, G. M. Butler, G. Fuyller, I. R. Walker, O. G. Gerould, D. S. Irelan, Sr., D. S. Irelan, Jr., S. F. Richards, G. W. Keltz, V. O. Spencer, F. M. Spencer, A. B. Brion, H. R. Brion, Jacob Hartman , H. J. Marvin, J. H. Harmon, J. M. Everetts, Miles G. Lee, H. Levalley, George W. Johnson, M. R. Walker, A. M. Bennett, C. F. King, G. S. Harding, Nelson Clemmons, V. N. Levalley, G. H. Coe, A. F. Packard, Uri Ferguson, H. Brown, L. S. Townshend, G. A. Spring, B. W. Harrison, Sol Blanchard, S. D. Forrest, D. S. LaFrance, E. R. Meeker.